Floating World Projects: TRANSITLINES Opens Today! 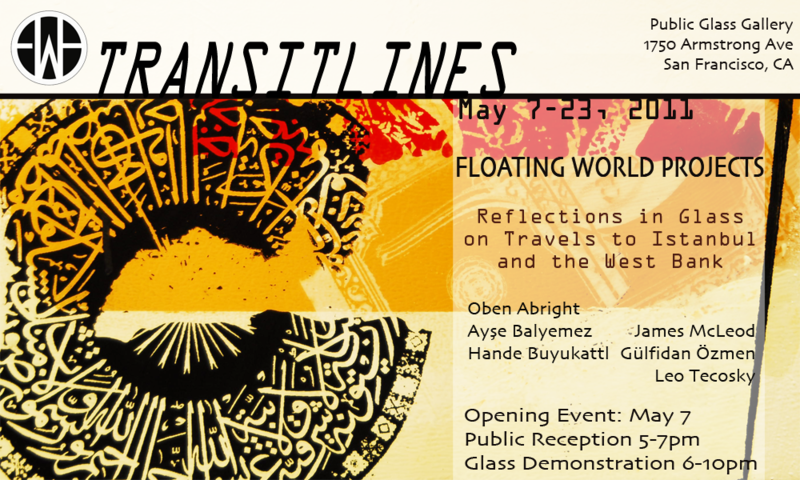 Floating World Projects' new exhibition "TRANSITLINES" opens today at the Public Glass gallery in San Francisco! It culls together a number of collaborative pieces made by Turkish and American artists, incorporating silkscreen techniques on glass panels. The work aims to comment on relations between our two cultures and blur the line between them. The exhibition is partly a fundraiser for FWP's documentary The Road to Hebron, currently in the post-production process. If you're in the area, check it out! The exhibit runs from May 7-May 23, with a special glassblowing demonstration and opening event tonight at 6pm.